Last week I scrubbed in to surgery with Tampa Bay Rays Team doctor, Koco Eaton to observe one of the most amazing surgical performances I have ever seen. The patient was a college pitcher named Zach. He is a former JUCO guy from Arizona who had previously topped out at 97 mph and currently has a scholarship to a division 1 school. I first met Zach about 2 weeks into our Summer Program after his mother had called me and said he was ready to eject from the Jayhawk summer league because ever since his last JUCO start, he had been experiencing arm pain, losing velocity, and basically getting his rear end kicked every time out. Zach is a tough kid… a really tough kid. His mother reported that he had been pitching through his pain for about 2 years. I told her to get him to Tampa as quickly as they could and I would be happy to work with him. When he showed up, we conducted a 9-part assessment that included a baseline radar gun reading of a whopping 78 mph. We immediately started a plan to get him pain free first, then to regain his lost velocity. After a few weeks, he was able to throw without pain, but his velo was still in the mid 80s. Finally, he tried to ramp up the intensity, but he had to shut it down after only a few throws due to increased pain. I called Dr. Eaton and got him in for an appointment that day, where an MRI revealed that he had a torn labrum, a teres major tear, and a HAGL lesion (humeral avulsion of the glenohumeral ligament – a rip in the front of his shoulder capsule). 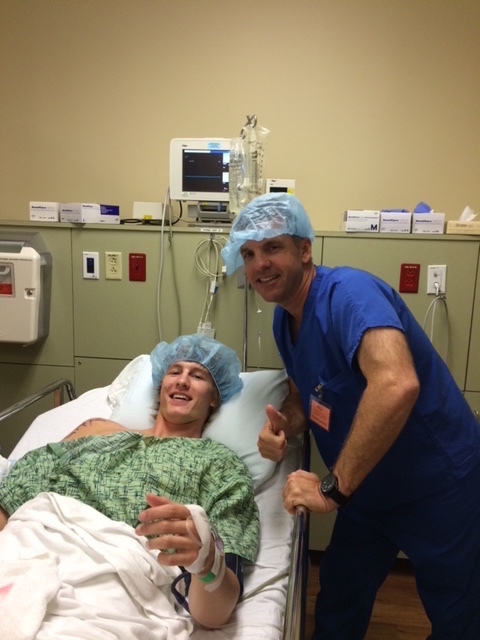 Dr. Eaton performed an arthroscopic labrum repair first, then sent Zach home for 10 days to allow his inflammation to subside before opening his shoulder to repair the rest of the damage. I heard what he had planned, and I couldn’t wait to see the master at work. I joined Zach in the operating room and watched as the anesthesiologist performed a nerve block and put him to sleep. After the nurses draped him and prepared his shoulder for surgery, Dr. Eaton came in. I could tell he was amped up and ready for the challenge. 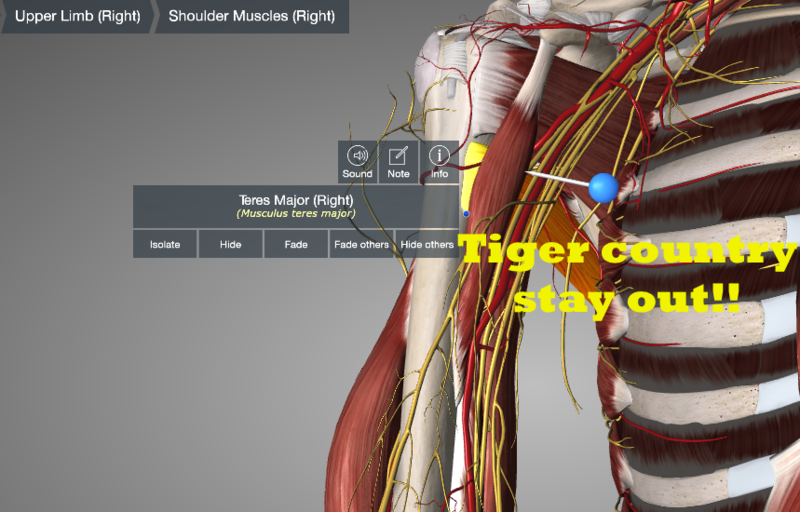 I stood in the corner and watched in amazement as he inserted a needle through an arthroscopic tube to mark the region he called “Tiger Country” – his term for the area of the shoulder and arm pit abundant with nerves, arteries and veins that he needed to avoid. Next he opened the shoulder and removed the subscapularis tendon from the bone (that’s the rotator cuff muscle on the front of the shoulder. 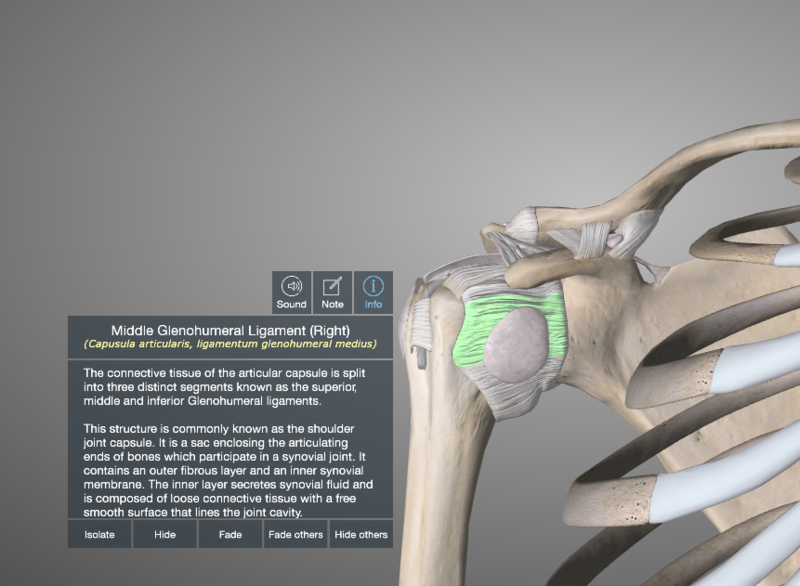 It internally rotates the shoulder and provides stability in the front while seating the head of the humerus in the center of the shoulder socket). 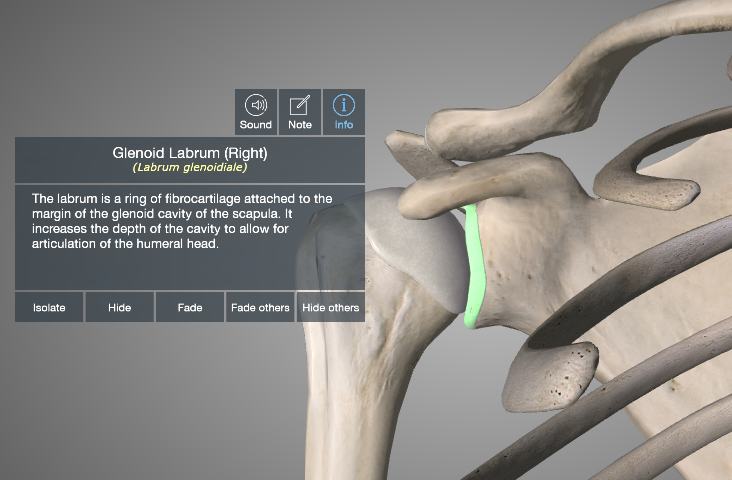 From there, he carefully opened the anterior capsule and exposed the head of the humerus. Normally he would have approached the teres major repair from the back, but since he needed to work on the HAGL and the capsule, he would have to get at it from the front. This was an extremely difficult surgery, and Dr. Eaton was totally locked in and on his A game. He later told me that the 2 ½ hours seemed like about 10 minutes, because he had been so focused on getting this right. In my corner of the operating room, I was nearly shivering with cold, but Dr. Eaton was so intense and working so hard that he began sweating profusely. His amazing team of nurses had to wipe the sweat from his brow 3-4 times during the procedure. He had to change his shirt before he could go and greet Zach’s mom after the operation was complete. During the procedure, I began to piece together Zach’s mechanism of injury. If I could figure out how something like this happened, the knowledge gained would help me in Zach’s rehab, and it would help me help countless future clients. While Dr. Eaton was cutting, drilling, and stitching, I was standing in the corner and going through the pitching motion while trying to feel my own teres major, biceps, and latissimus dorsi. I began piecing together the kinematics and comparing it to the pitching history he had reported to me at the beginning of the summer. The light bulbs in my head began to flicker and then finally, it all became very clear. I randomly shouted, “I got it! I know how he got hurt!” It was an awkward moment when the entire surgical team stopped their work and turned to look at me. I couldn’t control my enthusiasm. Thank goodness the volume of my voice was slightly muffled by the surgical mask. During the surgery, Dr. Eaton had tough time grabbing any part of the teres major “It was like trying to grab a piece of hamburger meat,” he’d later say. So, he used an abrasive tool to rough up the bone and make it bleed. Then he laid the remaining teres major on top of the bloody attachment point. This would eventually allow the tendon to scar down to the bone and provide some stability. 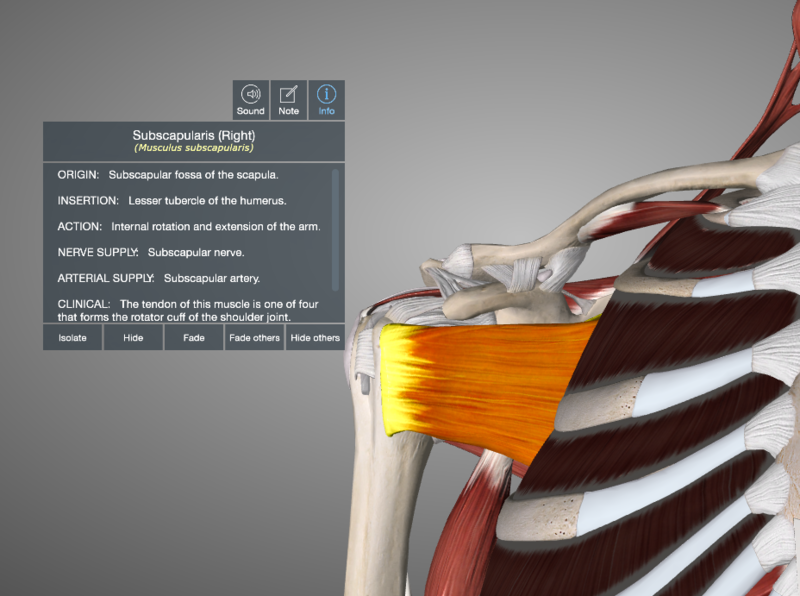 Once the teres major was in place, he repaired the anterior capsule and reattached the subscapularis. After the surgery, Dr. Eaton was stoked. We exchanged a few robust fist bumps, and he went out to talk to Zach’s mom. Obviously she was relieved and ecstatic that everything had gone well. As we navigate through Zach’s rehab, I’ll have my own “Tiger Country” to worry about. The process will take about 12-18 months before he will return to the mound. During the next 1-2 years, it will be critical that I work closely with him to thread the needle perfectly between progress and protection. Initially he will be immobilized for 4 weeks to allow the subscapularis and teres major repairs to scar down. Then we’ll start gentle pain free passive range of motion to prevent the joint capsule from getting too tight. If we push too hard, we run the risk of disrupting the repair. If we go too slow, we increase the possibility of joint stiffness. During this time, we’ll be working very hard on strengthening the posterior rotator cuff, and the backside decelerators and stabilizers. Once he begins throwing, we’ll need to progress very slowly – perhaps staying in the Durathro Training Sock until he is pain free. Over time, we’ll re-pattern his movements and let his pain (or lack thereof) guide us home. And perfect we will be. It will be my distinct honor to work with him. The depth of knowledge I gained from observing Zach’s surgery and the value it will have to future clients is immeasurable! My mind is exploding with creative ideas for creating functional exercises to better prepare the shoulder and elbow joints for the rigors of high velocity pitching. I am infinitely thankful to Zach and Dr. Eaton for allowing me to learn. Then we need to see you. Call us at 1-866-STRIKE3 and schedule a Precision Strike One day One on One Evaluation and Training Session. Or you can sign up for one of our amazing 3 day Rocket Launchers Training Camps.